We here at K.O.R.P. are proud to announce that we are a club for kids and adults of all ages. Trying to teach young kids about safety and how to handle a paint ball gun. We are also trying to educate non-paintballers about the sport . We are all about having fun and RELAXING. We attend the big scenarios, rec-ball and when the group gets a little larger we will start attending tournament games. Scenario games consists of role playing and acting along with paintball. there is usually a lot of give -aways including guns, masks, pod holder, squeegees, and lots more. We are based out of Plymouth Indiana. We have been a paintball team for 5 years. Our team started out as "The Dead Orc's" and it consisted of Ralph, Chris, and Rick. We competed in a tournament at michiana paintball and placed fourth at that time. After that we decided to expand and add a few members to our team. We started playing a lot of rec ball and when MXSportz came to Laporte a couple of years ago, we all had to go. That was our first scenario and we decided after that we would come to any scenario that Sherwood forest would hold. We are now a mainly scenario based team. 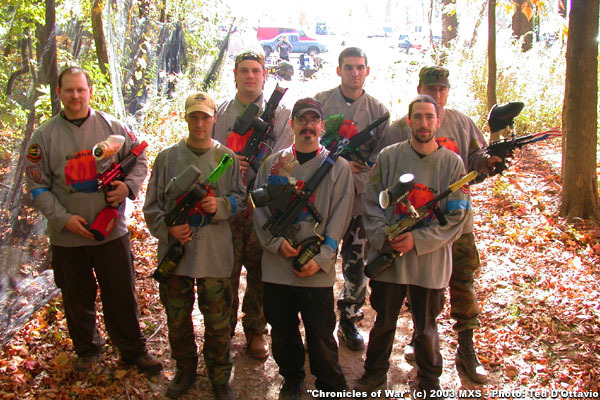 But we are not letting that limit us to the game.We play recball at Paintball heat. PBHeat is located 7 miles west of Plymouth In on US 30 3/4 of a mile south on Union Road. Paintball Heat is a High Energy Assault Tactical Field. Which translates into 4 floors of heart pounding excitement. You play all 4 floors at the same time, going room to room. Everyone will have to try this field, Play Safe, Play Fair!